Homes with drab landscaping rent more slowly, for less money, but those with fancy landscaping can require lots of maintenance. So how do you achieve a good-looking yard that enhances rental value without creating an expensive, labor-intensive headache? It's easier than you might imagine creating low maintenance landscaping. Here are eight tips for striking the perfect balance between beauty and ease of upkeep. Choose plants that thrive in your area without demanding a lot of watering, trimming, fertilizing or other upkeep; any local nursery (or a Google search) can tell you what the best choices are. Some plants are fussy, others are stalwarts; stick with the less needy ones. The beauty of flowering perennials is that you plant them once and they return to add their color every year. Evergreens, of course, provide a fresh green look through all the seasons. Ornamental grasses look great too, and require only to be cut back once a year. Reducing grassy areas that need to be cut and watered is a big money and labor saver. Decks and patios are attractive to renters for outdoor living and entertainment while reducing upkeep. Yes, you’ll spend more money upfront, but you’ll spend it only once. Xeriscaping (choosing plants that require little or no water beyond what the climate provides) reduces the need for sprinklers, saves water and eliminates the need to rescue droopy plants. Green consciousness and water shortages have led to the flourishing of xeriscaping, and books, articles, and web information abound on how to make it look great. 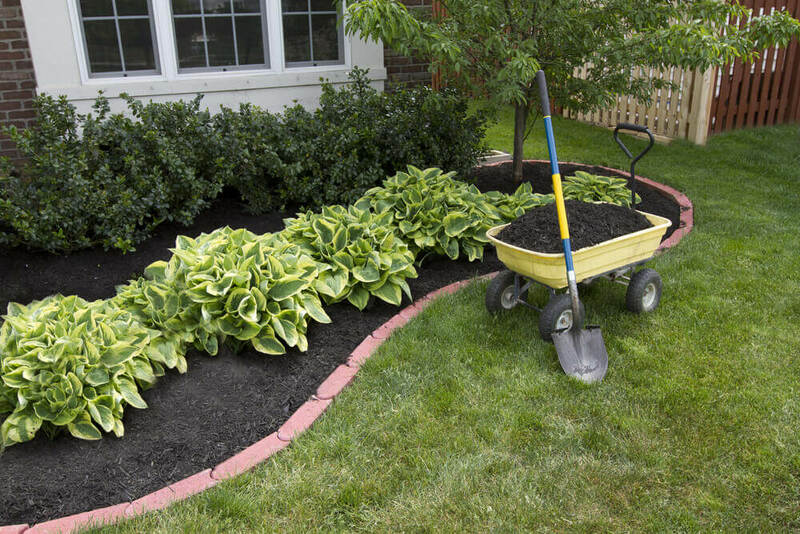 Mulch prevents weeds, looks neat and breaks down gradually to feed surrounding plants. It even smells good! Decomposed granite has a clean, attractive appearance and requires virtually no maintenance. 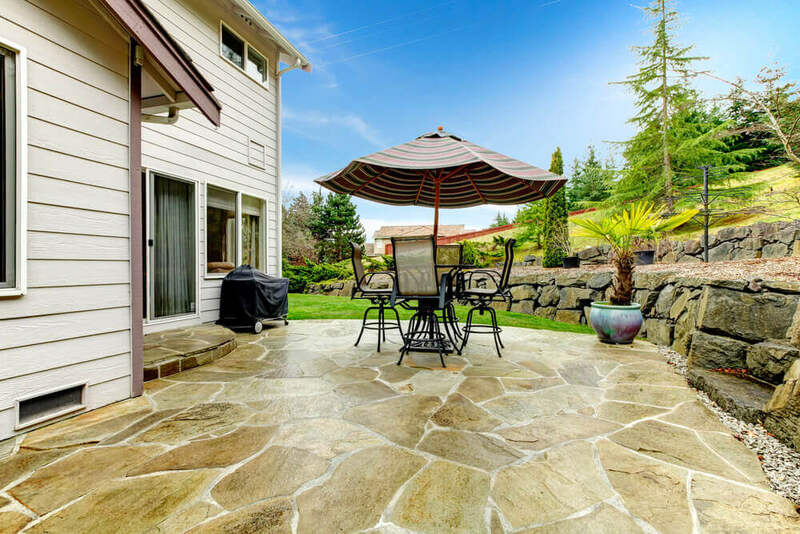 Integrate patio areas with stone pathways surrounded by plant beds for an elegant, low-maintenance backyard. Add easy-care potted plants as accents. Have no fear, artificial grass for landscaping has come a long way since Astroturf. You might be surprised at how much more realistic it is these days. Google “artificial grass” and have a look. The advantage is obvious: no upkeep. There are more and more great looking yards out there that combine artificial grass with low-maintenance beds, patios, and plantings for a beautiful effect with very low maintenance requirements. When choosing flowering plants, emphasize those that flower for a full season rather than a couple of weeks. You’ll have color in the yard for long periods of time. If your landscaping does incorporate lawn areas, you’ll reduce water and fertilizer use (and reduce brown patches and disease) by carefully considering your options for grass and choosing the one that does best in your particular area. There are even thick, no-mow, low-water lawn grasses available these days that will thrive in certain areas. 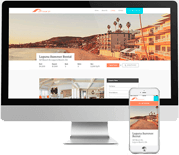 Follow these tips and you won’t have to compromise the appearance and rental value of your properties to keep your costs and labor under control.